In the States there was recent Public TV reports that those Egyptian mummy and treasure shows that used to tour major US cities and were hugely popular now suddenly got too expensive for many nuseums. Basically the Egyptian government says yes those were good tours that promoted Egyptian culture/turism etc., but why should we show them to you free. Therefore, now the contracts set minimum revenues and heavy upfront payments. I wonder if any dots can be connected here. Haha! This I gotta see! It’s all so unbearably kitschy (just like the movies), but hey, I have no problem with that. The Mummy Returns was the best bad movie I’ve ever seen. I’m looking forward to the Sinbad movie that’s coming out. Sinbad will be played by Keanu Reeves. Haha, that is priceless! I wonder if it’s related to Brendan Fraser being on the judges’ panel for the Shanghai Film Festival. Or the recent decision to film Mummy III in China. This was all announced after the May holiday, but there could have been deals going on behind the scenes. I’ve been a lurker here for some time, but never could come up with a good reason to post. Many of my Chinese friends and students, when asked where on earth they’d like to go, mention Egypt with the pyramids and mummies…so this is not much of a surprise for me..i think it is aimed more for the chinese fascination with egyptian stuff and less related to the movie. 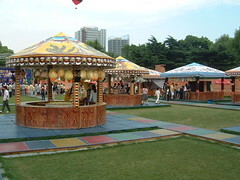 was zhongshan park free before? (well, obviously) I guess my question is just whether or not they’ve done stuff like this before. I lived over on Dingxi Lu for awhile (like, a block away) I mean, I know they did stuff for the 50th anniversary and have rides, but I’m curious as to when they came about. I’m kind of glad they didn’t mummy out the park when I was living there. Too much kitsch to drive/walk past every night. The park charged an entrance fee at one point, but became free as the Shanghai city government works to open up more parks to everyone. This may have been as recent as early this year, as it was for many of the city’s parks. The park is still free right now. The Mummy thing occupies only a relatively small, fenced-off section of the park. I am Regan Fraser, brother of Brendan. I’ve never been to China, but every pair of shoes that I’ve bought at a nearby mall is Made in China. Including all shoes for sale at Sear’s or Wal-Mart! As I write, I sit at a computer in Halifax, Canada. I think it’s maid in China, too. Wow those Chinese are some busy people! 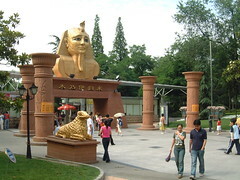 I think the review about The Mummy park in Shanghai was/is hilarious. I know what rmb stands for! For a time, I was employed as a cashier at a nearby supermarket and all the Chinese students with their VISA cards buying food would pay that way and explained to me that means “Ren Men Bee”-so I guess that 80 rmb is a lot of money to pay to walk thru a city park. To try to win cheap prizes… I’m sorry, gotta lol. From my POV, it would appear that China is definitely getting a grasp on the concept of capitalism. Just in time to offer locations for movie shoots and AND host the 2008 Olympics! PS Can anyone answer these 3 questions, please? : (1) How many rmb is admission to Chinese movie Theatres? (2) Has the waterfront shoot of a Shanghai chase scene been safe and sane? I hope some English or American or Canadian eyewitness on that can say. (3)If anyone can talk to Brendan, tell him his brother Regan loves him and thanks him for all his attention. Tell him congrats on being a dad 3 times over. I am the UNCLE!!! And that Yuk Yuk’s comedy club in Halifax won’t let me even have an act on Amateur Night. Then again, that could be a good thing as I would rather turn professional, wherein I’d crack jokes about the incredibly industrious Chinese! Oui. J’ai etais en Avignon pendant 1987/88!